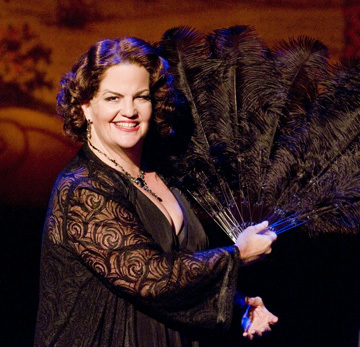 REVIEW: "Sophie Tucker: The Last of the Red Hot Mammas"
New Repertory Theatre is serving up a summer treat with "Sophie Tucker: The Last of the Red Hot Mammas." The one-woman show (with pianist) is fun, thanks to the robust talents and personality of Mary Callanan (below) . But the true measure of a show's measure comes via the basic question: "What did they set out to do" and "How well did they do it?" If creators Richard Hopkins, Jack Fournier and Kathy Halenda aimed to entertain with a roster of Tucker's hit songs highlighted by a sprinkling of the singer's bawdy stories, then "Sophie" would appear to be on target. A simple target, but on target all the same. However, if the evening is meant to delve deeper and present a fuller look at the feisty woman behind the boa, it doesn't quite have it together yet. Presented in two short acts, the first half is a breezy musical romp. Only late in Act Two do the authors attempt to inject any real sense of biography. It's touching, and Callanan treats the material with respect. But the evening would have benefited if that particular tone of "the woman vs. the entertainer" were set much earlier. There's more to be mined here. And truth be told, the entire evening would have benefited if the piece were presented without an intermission. Physically, the show is dwarfed by the playing area. This is set up as an intimate evening, and the stage is just too big for what director Kate Warner lays out. There's a baby grand piano downstage left. Callanan tends to work there as well as along the lip of the stage, very close to her audience. Far upstage right is a wardrobe trunk, a table (with virtually no purpose) and a Victorian settee. Having Callanan mingle among these pieces pulls focus. And when she sits on the sofa and sings, she's just too far away from the audience. Sophie Tucker was an outspoken, trailblazing entertainer -- a gutsy star of vaudeville whose career spanned seven decades. With her own look and style, she never fit the mold producers had in mind. So she just elbowed her way in and carved out a place all her own. Known and loved the world over, she was born Sonia Kalish in Russia and came to Hartford, Connectict, as an infant. (She later lived briefly in Boston's North End.) As a performer, she instinctively knew what worked for her, kept her nose to the grindstone and rose to incredible heights of fame and success. She would subsequently provide the inspiration for dozens of entertainers to follow. With a big voice and a personality to match, Mary Callanan is an ideal choice for the role. She herself has become one of Boston's busiest and most popular entertainers. That was clear from the rousing hand she got the moment she walked onstage. She just finished a long run (extended twice) in "The Great American Trailer Park Musical" at SpeakEasy Stage. She'll be appearing in "The Music Man" at Reagle Players shortly. And this fall, she hits Canada in a national tour of "Mamma, Mia!" So there's no lack of talent here. As a gifted singer, she can tell an entire story within a song. And were she provided with better support from the authors, she's just the artist to make this show soar. Among the numbers she sings as Sophie are: "Some of These Days," "You've Gotta See Your Momma," "Living Alone And I Like It," "The Lady Is A Tramp," After You've Gone," "A Good Man Is Hard To Find" and "Follow Your Star." Callanan is aided (and abetted) by Todd C. Gordon (far left, above, as Tucker's longtime accompanist Tony Shapiro) on the piano. Gordon, too, is a Boston pro, although he's not usually seen onstage. Here he plays beautifully and gets a chance to banter with his star. As Sophie, Callanan departs once or twice to amble out into the audience for a little interaction. Trading barbs with the theater-goers, she's funny and natural, due, it would appear, more to Callanan's inherent wit than the script. And in the second act, Sophie gets two of her male admirers to jump onstage and help her with a hula. So in the end, Mary Callanan sings at the top of her game and delivers the punchlines like a pro. But question is this: would you rather have a bowl of ice cream with chocolate sauce, or a Hot Fudge Sundae smothered with whipped cream and marshmallow, sprinkled with chopped walnuts and capped with a glistening cherry on top? Either can tickle the taste buds, but one is a snack and the other is a sweet feast. 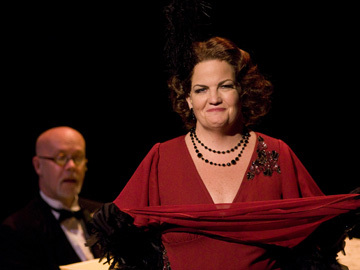 "Sophie Tucker: The Last of the Red Hot Mammas" is at New Rep in Watertown through July 11. For information, call 617-923-8487.